Last week for Strong Female Character Friday, we kicked off our series of articles examining strong representations of Asian-American femininity by looking at Lane Kim, Rory's put upon best friend from Gilmore Girls. Our point in talking about Lane, a fantastically complex and fun character, was that her role as a perpetual background story of Rory's life did her a disservice. Lane is awesome and complicated and deserved her own storyline, even if the show is called "Gilmore Girls" and not "Kim Women". Which would be a great other show that should totally happen. Just saying. In looking at Lane we were also looking at the tendency for shows and movies to push Asian-American women aside by putting them in best friend roles, the kind of roles where they can pat themselves on the back for including diversity but not have to actually engage with any kind of challenging storytelling. That kind of thing. This week, then, we're going to extend our net a little further and talk about a female character who arguably occupies a space very similar to Lane's - the Asian-American best friend from a strict family whose storyline revolves around her friend - but which executes this story very differently. We're going to talk about Connie Maheswaran from Steven Universe and the right way to tell a best friend story. In a happy turn of events, it feels like Steven Universe as a show is only becoming more popular with each second I spend typing this. So I'm not even going to bother taking the time to explain the premise to you - but if you need to know you can check out my explanation here - and we'll just dive right in. Suffice it to say, Steven Universe is an animated children's show about a bunch of kindhearted aliens who save the world, and Connie is one of the few humans who knows what's up. Connie Maheswaran comes into the story of Steven Universe kind of late in the game by their standards. They've already been on Earth for thousands of years before she shows up, and Steven himself has already been around for like thirteen years. But Connie's arrival does seem to herald a shift. When Connie comes she's right on time to help Steven come into his powers and process them, making her an invaluable part of the team, his best friend. Connie likes being Steven's best friend. She really does. She loves how free and open his life is, enjoys the sense of adventure and unexpected, and even kind of digs the occasional world-threatening danger. She likes it a lot more, at any rate, than she enjoys her relatively strict homelife. It's not that Connie doesn't love her parents, but more that as an only child of high-achieving parents who move a lot for work, Connie is desperate for a life that doesn't make her feel that pressure. She wants to experience more than just violin lessons and extra math homework. Which is definitely the start of how she ends up hanging out with Steven. But it quickly goes a lot deeper than that. See, like any good character, the further we get into the story, the further we get into Connie as a character. 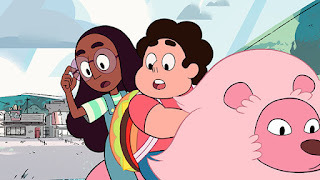 Far from the early days where Connie and Steven were just running around having fun, the two of them eventually develop an incredibly close bond, with Connie even learning how to swordfight so that she can protect Steven in battle. Because, yeah, they're close enough friends that Connie wants to be there to protect her friend on the literal field of battle. She's devoted to Steven, though occasionally in a kind of unhealthy way. She's Steven's first crush and he's hers. They share books and TV shows and jam sessions and when they imagine the future they're always together. 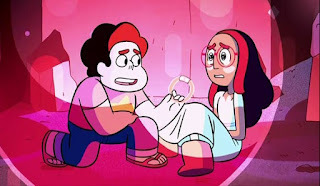 Hell, when Steven learns how to fuse his first fusion is with Connie, a coming-together that happens because they both just enjoy being around each other so dang much. So while Lane on Gilmore Girls spent more time in the background as time went on, pushed out by Rory's ever-expanding life, Connie is being brought into Steven's ever-expanding life and being made more and more a part of it. Which isn't just better development, it's also a better statement when we think of her as a minority character. Let's take a step back and look at this. We know from interviews with the cast and crew that Connie, voiced by Grace Rolek, is Indian-American. Based on some basic nameology or what have you, we can pretty reliably place her family as originating in Southern India and being Tamil. * Not super important, but interesting. What is important is that this means Connie is a character of color. And we knew that, but it gets even cooler when we think of her role in the show. 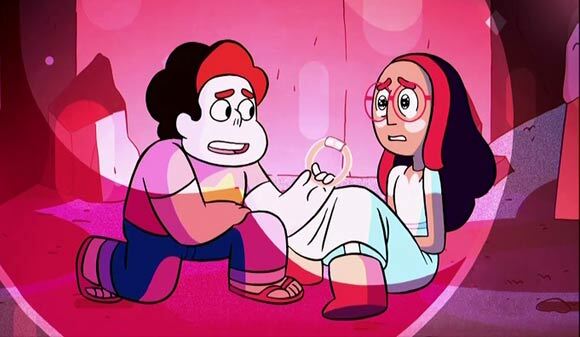 Connie is Steven's link to human life, sure, we get that. Between Connie and his father Greg, Steven gets to be tied back down to Earth, making him all the more willing and motivated to protect his home planet. Garnet, Amethyst, and Pearl might have all chosen to protect Earth, but Steven received the protection of Earth as his birthright, passed down from a mother who swore to fight for this planet and a father who just so happened to be born here. Connie, on the other hand, doesn't have this big epic story. It would be very easy for her role in the narrative to be the typical girlfriend role: the one who reminds the hero what he's supposed to be saving. And to some extent that is what Connie does. Steven sometimes thinks of her as a stand-in for humanity, not in a bad way, but in a "here is the human being who is not related to me for whom I feel the most feelings" way. Connie reminds Steven what it is to be human, whether it's questioning why he doesn't go to school or asking silly human questions like, "How old are you really?" 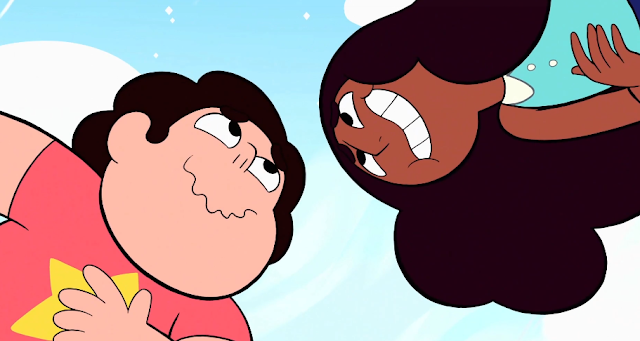 Connie reminds Steven how to be human and that's fantastic. It is also, however, a very small portion of what she does. I don't know what will happen in the future, but if something dangerous comes along, I don't want to be a burden, I want to help! I want to be there for Steven, to fight by his side! The Earth is my home too, can't I help protect it? Seriously, she's got more guts than adults three times her age, which mixes together to make Connie a really fantastically cool character. I mean, it would already be new and different and great for Connie to be a well-rounded best friend with her own story arc who represents humanity and just so happens to be Asian-American. That would be rad. But to have this Asian-American girl being one of the few people to step up and say that she wants to save the world? That's huge. That is actually a very big statement about the world. It's saying that the world does not inherently just belong to white people and everyone else happens to live here. And while that might sound like an obvious statement, it is shockingly rare to find an example in Western television of a world protector who isn't white. So to have Connie stand up and ask to help defend the Earth really is a big deal - she's a visual representation of all of the good in the world, of our capacity for kindness and learning and sacrifice, and she's brown. That's a big deal for me, a white adult watching this show. Imagine then what an even bigger deal it is for the thousands and thousands of kids of color who get to watch it. Who get to see a hero who maybe looks like them saying she's going to fight for her planet. Who get to see her push back against societal expectations. And who get to see her being a very very good friend. 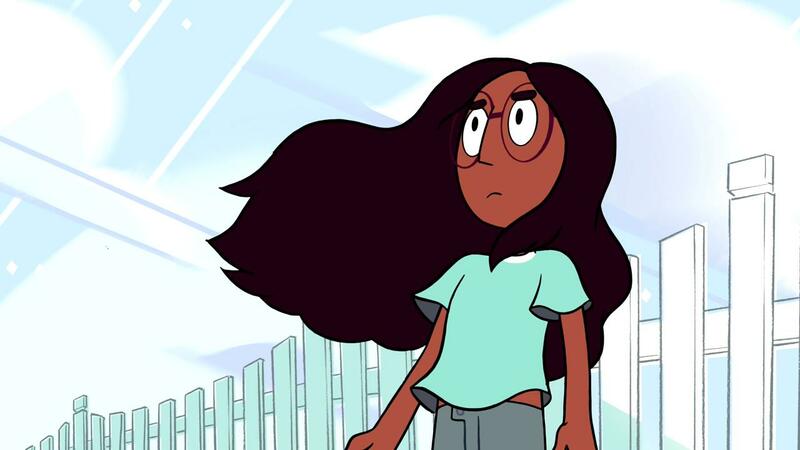 Connie Maheswaran is pretty damn important. It really is funny for me to look at Connie and Lane side by side. They have all at once so much in common and so much not. They both come from strict households where they are pushed to achieve and live up to expectations, though Lane's expectations are more religious and cultural while Connie's are more academic and musical. Their best friends both come from non-traditional family units which they worry their very traditional parents will find hard to accept. They are both devoted to their best friend and enjoy spending time with this other person who is so different and so wonderful to them. But where Lane gets pushed further back every year, eventually only appearing every five episodes or so for ten minutes a piece, Connie has become more and more integral to the functioning of the show as time goes on. You can't have a Steven Universe without Connie anymore, and that's a really big deal. 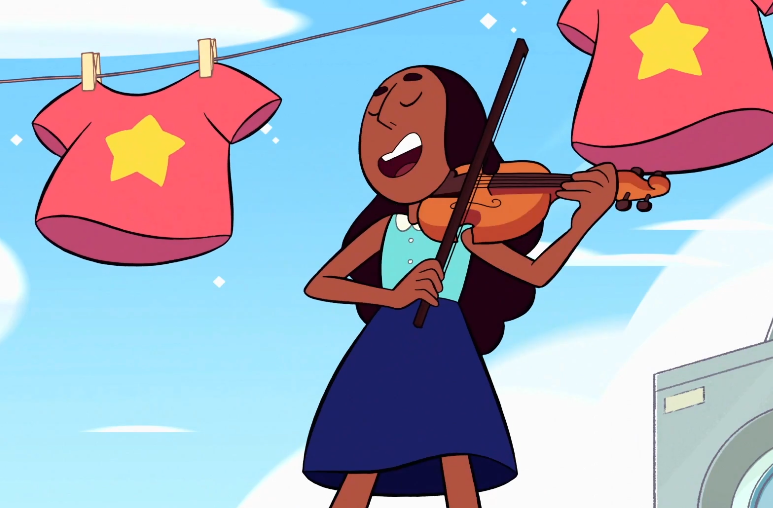 In a world where Asian-American characters are lucky to even be the best friend in a show not about them, Connie's increased relevance and her entire arc of strength and responsibility are incredibly important. She exists as a reminder that there's nothing wrong with being a best friend, as long as you're actually an equal. *It's also worth noting that in "Sworn to the Sword", the episode where Connie learns to swordfight, she ends up in a very particular outfit which was intentionally designed to mimic what practitioners of Kalaripayattu wear. 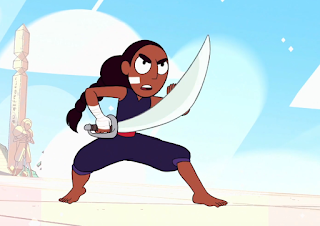 Kalaripayattu is an Indian martial arts/swordfighting style - Connie's blue uniform, braided hair, and actual fighting form are quite representative of this fighting form, an intentional nod to her heritage and a super cool thing to include in the show.